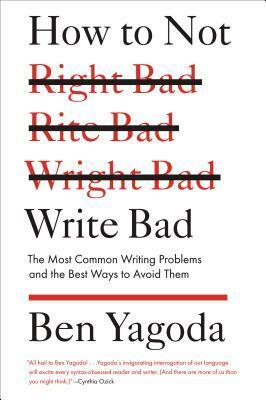 Mr. Yagoda's How to Not Write Bad reads as a modern update to Strunk & White's classic The Elements of Style. The conversational tone, with liberal dashes of humor thrown in, feels like a friend offering writing advice - straightforward, common-sense advice on how to, well, not write badly. He includes easy guidelines for avoiding common grammatical errors and punctuation mistakes, but also provides some more general suggestions gleaned from his "twenty years of teaching advanced journalism and writing classes at a selective university." First of all, don't aim too high, he warns. "Most students, I've found, can't handle writing 'well.' At this point in their writing lives, that goal is simply too ambitious... You have to crawl before you walk, and walk before you run. And you have to be able to put together a clear and at least borderline graceful sentence, and to link that sentence with another one, before you can expect to make like David Foster Wallace... What I'm talking about here is good-enough writing. As with parenting, it isn't necessarily easy to achieve, but it's definitely achievable. And it's a decidedly worthwhile goal." Reading improves writing through a wide exposure to the writing of others. "It's the very best and most painless way to absorb the rules of the language" including spelling, punctuation, and style. "Trying to be a not-bad writer without having read your share of others' work is like trying to come up with a new theory in physics without having paid attention to the scientists that came before you, or writing a symphony without having listened to a lot of music. It's possible, I guess, but extremely difficult." So if you want to write, read. Reading also gives you a broader base of knowledge from which to write. "If you are un- or underinformed about your subject, you will hem and haw, engage in the passive voice and qualifiers, and overgeneralize. If you take the trouble to fully research it--and, equally important, think hard and rigorously about it--you'll be specific, precise, and authoritative. In other words, knowledge leads to good writing." So if you want to write not-badly, read some more. One idea I need to take to heart (as I sit here typing on my laptop with nine browser tabs open, including Facebook) is what Yagoda calls "mindful writing." "I am convinced that multitasking--either the act itself or a multitasking state of mind--promotes the mindless writing I am confronted with every day. Without a doubt, if you have several things going on at once, you are perfectly capable of expressing an idea along the lines of Dude, where should we eat? or OMG, did you see what she's wearing? But anything more complicated than that--and anything you would want to write for a broader public is more complicated than that--well, it just can't be done."